Everyone likes to hear the announcements of happiness with a pinch of sugar and salt. 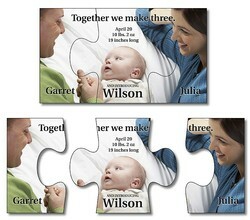 And this can be easily done through a 3.5 x 2 3 piece puzzle shape announcements magnets. They suit all occasions – kid’s birthday, retirement party, and baby shower, or anything that you can think of. This magnet will equally capture the attention of elders and young ones due to their unusual frame. People seeking it need to pay something $0.53-$0.09 for personalizing this magnet.